*Sponsored in partnership with Hartz. All opinions are of my own. Our pets are family and we should treat them as such! We have two dogs, a pit boxer mix and a small terrier mix. It's funny how much they differ but still can not be away from each other! Our larger dog eats quite a bit! In fact he robs our little one of her food sometimes. But she totally lets him! Because of this, we often give her small treats throughout the day, something special for her in between meals. Hartz now has the perfect "in-between" meal treat! Perfect for small dogs, Delectables Stew is a yummy and lickable wet dog treat for those who love to pamper their pets. These convenient, single-serve pouches provides doges with appealing, low-fat treats made with real chicken, beef, cheese and vegetables, without meat by-products. We let both our dogs try this product and both love it! It was just the right amount to tide them over in between meals. 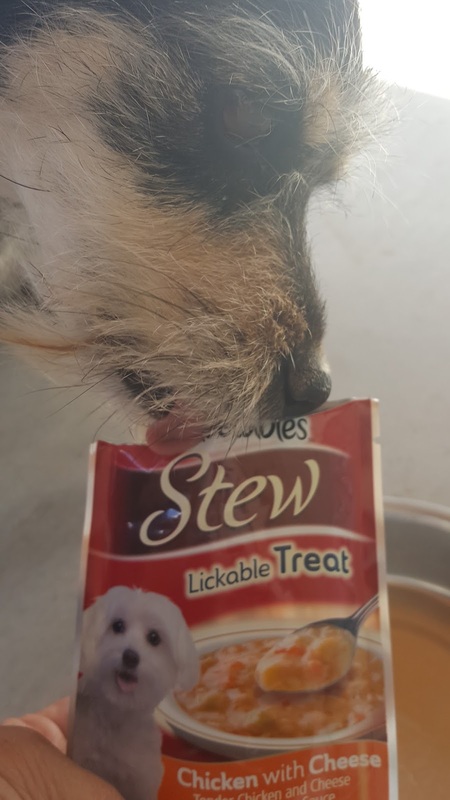 Connect with Hartz and share your photos and videos of how your dogs lick up Delectables during the Delectables "Tongue Out Tuesday" Sweepstakes, with the hashtag #LickItLoveIt to participate in weekly drawings for a chance to win Delectables Stew Lickable Treats.